We all have those days when a yawn, or two, escapes us after lunch or during an important meeting. We may be a bit tired or bored with our present situation. But what if you have excessive yawning? What do you do when your yawning is constant or even happens over short time periods? And how do you stop yawning so much? There may be more to the yawning than just tiredness. Let’s examine causes and what steps can be taken as home remedies for excessive yawning to treat this phenomenon. A yawn is an involuntary response by our body to fatigue. It can occur at the most inappropriate time. Yawning due to lack of a good night’s sleep or at the end of a day does not raise alarm, but excessive yawning should be further examined. It could be caused by a lifestyle change, medications, or even a serious underlying health condition. Excessive yawning is sometimes referred to as a vasovagal reaction in medical terms. It relates to the workings of the vagus nerve, which can slow the heart rate by dilating your blood vessels. For this reason, many cases of excessive yawning stem from heart disease or disorders. It may also be caused by psychological distress. 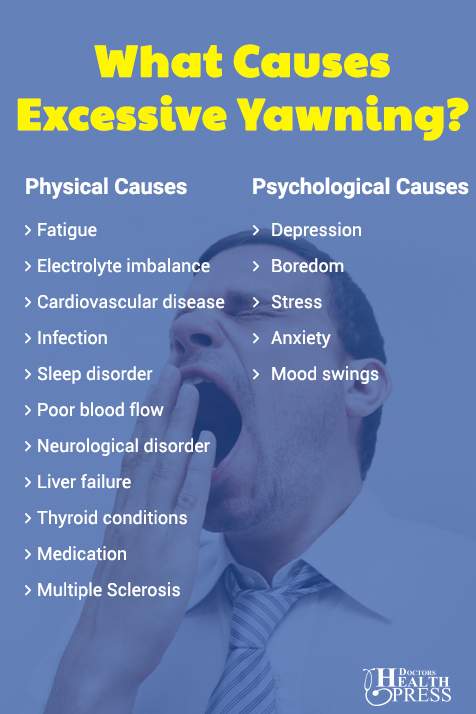 The following are common excessive yawning causes. In some cases of excessive yawning, a patient may be facing a life-threatening condition such as stroke, seizures, or an aggravation of a serious respiratory disease. 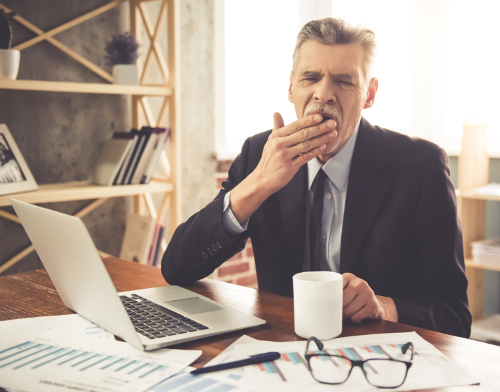 If you find yourself yawning more than usual—perhaps yawning all day—and sleep does not seem to help decrease the episodes, it’s important to determine the cause. It may have a major impact on your lifestyle and on your health. How Do You Stop Yourself from Yawning? There are times we try to stifle a yawn, especially when we are at work or in the public eye. When your yawning becomes excessive and begins to interfere with your daily activities, there are steps to take to avoid yawning. However, please remember that because it is a natural response, there is no cure for yawning or traditional excessive yawning treatment. Get six to seven hours of sleep each night. If you usually have trouble falling asleep, do activities to unwind before bedtime. Take a long, warm bath or read a book in a dimly-lit room. Take short naps when possible if you feel sluggish. Be sure to set an alarm as it is recommended to only nap for 20 minutes. Some people may need up to 45 minutes to feel fully rested. A yawn could indicate you need to get up and get moving if you work at a desk. Stand up and take a short walk, even around the office, when you feel tired. This will promote better blood circulation. Stop whatever you are doing at the time and take a break. Whether you are sitting at a computer, driving a vehicle, or even standing in one spot for prolonged periods, take several breaks throughout the day. Take deep breaths and exhale slowly the next time you feel a yawn coming on. Not only should you stretch your legs with a short walk, but you should also stand up and stretch your arms, neck, and back before fatigue sets in. Get fresh air by opening a window or stepping outside for a few minutes. Stick to a regular daytime and bedtime schedule. There may be times you have to work around projects, activities, or even travel. If need be, fake a cough or try to sneeze. This action can sometimes halt a yawn and may work to prevent an embarrassing moment. Excessive yawning can be an annoying occurrence, depending on where you are or who you are with. It may be also a sign of a serious health condition that if not treated, can lead to a life-threatening situation. It is important to treat the underlying cause before worrying about being seen yawning all the time. Episodes of excessive yawning not linked to a health issue can be addressed and possibly prevented with several easy measurements. “Yawning Excessively – Causes,” Health Grades; https://www.healthgrades.com/right-care/brain-and-nerves/yawning-excessively–causes, last accessed March 22, 2017. Dr. Chris, “How to Stop Yawning and Prevent Daytime Yawns,” Health Hype; http://www.healthhype.com/how-to-stop-yawning-and-prevent-daytime-yawns.html, last accessed March 22, 2017. Cameron, P., “What Causes Excessive Yawning?” Livestrong, August 16, 2013; http://www.livestrong.com/article/17288-causes-excessive-yawning/, last accessed March 22, 2017.